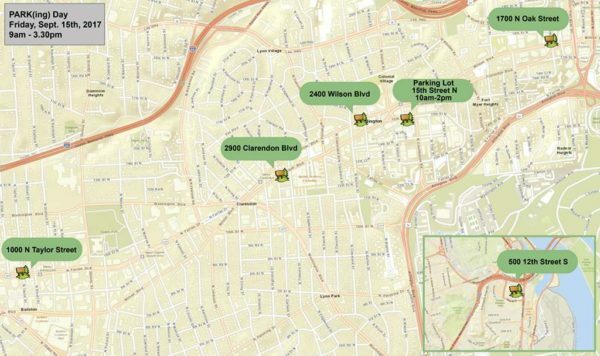 An on-street parking space in Rosslyn will become one of six pop-up parks in Arlington County tomorrow (Friday) as part of the worldwide PARK(ing) Day event. The space at the intersection of Wilson Blvd and N. Oak Street will be transformed into a “parklet,” a sidewalk extension installed in parking spaces that acts as a mini-park. A spokeswoman for the Rosslyn Business Improvement District said the site will be the location of the county’s first permanent “parklet” in spring next year. From 9 a.m. to 3 p.m., visitors can stop by and have free bagels and coffee from Allspice Cafe, enjoy the outdoor seating and play games like corn hole and foosball in the afternoon. The Rosslyn BID is also offering free giveaways and discount cards for nearby restaurants. Other “parklets” in Arlington will be found in the parking lot at 15th Street N. (Courthouse) from 10 a.m. to 2 p.m., and at 500 12th Street S. (Pentagon City), 2400 Wilson Blvd (Courthouse), 2900 Clarendon Blvd (Clarendon) and 1000 N. Taylor Street (Ballston) from 9 a.m. to 3:30 p.m.
More will spring up across the region, with 28 sites set for D.C. and at least seven for Alexandria. PARK(ing) Day began in San Francisco in 2005 when Rebar, an art and design studio in the city, turned a metered parking space into a temporary public park. Photo No. 1 via Google Maps, photo No. 2 via Arlington County.